Last month, the Citizens Committee designed to provide recommendations on future dog parks in this city submitted its recommendation after 2 years of work. In less than a month, the Parks board has decided the committee is completely wrong and made up their own criteria. The whole thing makes my head hurt. It's made a mockery of democracy and citizen input in their city. My entire rant on this is here. 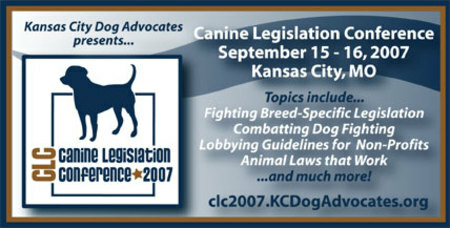 Back in September of 2007, the Kansas City parks board assigned a task force to study locations for new dog parks in the city. Kansas City has a population of about 500,000 people, and yet, only has one area of one park that is dedicated to off-leash dogs. 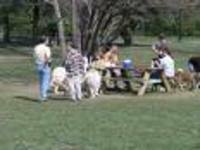 Tomorrow afternoon, at 2:00, at the Parks and Recreation office at 4600 E 63rd Street (over by Swope Park), the task force is going to present their recommendations for parks that would be good for dog parks. It is my understanding that the recommendation will include a dog parks at Sunnyside park (an area that was initially proposed by the public, and denied by the parks board before the task force was assembled) and then also another location in Midtown and one up North. I'm curious what they come back with after an exceedingly long time to prepare their recommendation. I provided my thoughts for this back in August of 2007, and then again in September, and stand by those recommendations. I would suspect that the task force will have focused more on the regional dog parks (similar to the one we have now) with little to no thought to actual neighborhood parks. But at least the idea of having more dog parks in the community will be on the table. I know funding is going to be an issue, but at least dog owners will have options for being able to raise their own funds to finalize the projects. I personally don't believe that every off-leash area needs a fence, but I'll take small victories wherever we can get them. So head on our to the Parks Board tomorrow to show support for dog parks in the community and provide your input. Greeley, CO has an agenda item tonight called "dogs in parks". The ordinance, a petition that was generated by residents, would open every Greeley park to dogs -- excluding some breeds such as pit bulls. That proposal is set to be voted on in a special, Feb. 3 election. Meanwhile, The city council is still considering an alternative to the proposal that would cost less and still allow dogs in some parks. If the council proposes its own ballot initiative, it too would appear on the Feb. 3 ballot. Apparently dogs aren't currently allowed in most of Greeley's parks -- and the city council has seemed resistent to changing this because they don't feel like owners are responsible enough to clean up after their dogs (citing public health concerns) as well as concerns that dogs will trample the grass lawns. Certainly I think its absurd that the city would not allow dogs in the city's parks -- although I do understand the concerns and frustrations of people not picking up after their dogs, I certainly think dogs should be allowed in parks (and people should be required to pick up after them). I just can't for the life of me figure out why owners of some breeds of dogs are not going to be allowed to walk their dogs in parks. Are owners of certain breeds of dogs less likely to pick up after them? Do 'pit bulls' trample more grass than say, Mastiffs? This whole thing is very odd -- but I will say it sounds like moving to Greeley won't be happening for me any time soon. Hopefully the citizens, and the city, can come to an agreement where people can walk their dogs in parks but doesn't descriminate against owners of certain breeds. Back in September, the Kansas City Parks and Recreation department did an online survey that asked about people's perceptions and attitudes of the KCMO Parks System. For the record, on the individual Parks and Recreation survey, I have no idea what the audience sample was -- or how it was promoted. I didn't really know anything about this survey ahead of time, so I don't really know how the 400 people who filled out the survey found it. However, it appares as if the online survey was filled out by the people who were mostly satisfied with the parks department, as about 250 of the 400 surveys that were filled out said that they were at least somewhat satisfied with the parks department (the highest parks satisfaction score on the entire larger city sruvey was "location of city parks" at 51%). The survey has a variety of people who used a variety of different park functions (Parks, lakes, golf courses, trails, zoo, community centers, athletic fields, tennis courts, etc). Less than 5 mentions: Parking, too much grass (plant more indigenous flowers), water fountains, playgrounds, lighting, too many homeless people, more community centers, recycling along with trash and more shade. Needless to say, the demand for dog parks is pretty high -- with 84 mentions. And before we just assume that the WOOF group block voted in this survey, there was a surprisingly large number of people who were requesting for more dog parks up in the Northland -- where there is a TON of open land and park space, but no dog park. The Parks Board heard from some of the folks at WOOF 18 months ago regarding the building of more dog parks (with one location in particular that was requested). At the time, the Parks Board assigned a task force to look into dog parks. It appears as if there is a meeting tonight of the task force group --but the most recent meeting minutes on the website are actually from all the way back in February of this year. Have they really not met for 10 months? Either way, this is pretty embarrassing that a task force that was assembled over a year ago still has not come forward with any type of recommendation on dog parks for the city. It's time for the city to step up responsiveness in this matter, and quit letting beauracrcy stand in the way of progress. BTW, I can't find the survey posted online -- but if anyone wants a copy of it, I will be happy to provide it. There are a lot of boards and commissions, but the Parks Board, whether directly or indirectly got called out in this survey. 6 of the lowest 16 scoring points on the survey directly related to the Parks Board programs. Sometime, gosh, 20 months ago or so, a group of Kansas City residents approached the city about building an additional dog park for the city. They approached the city with a plan, a blueprint, a park in mind, and a fairly significant amount of private funding. Unfortunately, the parks board denied their request. The city council spoke out against the decision, which then led to the board assembling a task force to come forward with recommendations on where to put multiple dog parks in the city. We're now more than a year from the forming to the task force and we've yet to see recommendations from the task force and any movement on this dog park issue. This is about dog parks. How can it take 16 months to put together a proposal on dog parks? If every commission works so efficiently, I can see why this one is so low. This number has been trending downward over the past 8 years...and still seems really high. But honestly, most people probably never give much thought to animal control. However, if more people knew that the city kills about 60% of dogs and 85% of the cats that enter the shelter, I'd guess this one would be lower. Tack on the reality that our response rate for emergencies in this city is 24 hours, it's pretty bad. Citizen satisfaction with animal control in other Kansas City metro area communities ranges from 37% to 81%. KCMO's is 33%. Meanwhile, our competitive set of cities (regional midwest cities like Dallas, Minneapolis, Omaha, Wichita, St. Louis, etc) have a 60% approval rate for animal control. (page 74). Yeah, it is that bad. The KCMO Dog Park Task Force is now hosting public hearing meetings for people to provide their input on dog parks in the community. The Task force was formed last fall following a push by local dog Park group WOOF for a four-acre dog park in 22 acre Sunnyside Park and then the Parks Board made a rash decision (with zero public input or discussion) by the Parks Board to no allow any dog parks in any park less than 100 acres. The Parks board then decided that the decision needed more input from the task force. So after 3 meetings, the task force is now ready to meet with the public. Two of the meetings are this week and one next. I have no idea what direction the task force will head with this. I've given my opinion on this on several occassions. My hope is that they do set up several more dog parks in the city. I hope that they consider both larger fenced in options, as well as other non-fenced off-leash areas. I hope that the WOOF group will consider scaling down the scope of their project -- as I think Sunnyside has some great areas for a dog park, but I think their proposal is to grand for the size of that park. I also hope the task force is innovative in how they come up with funding for the parks as no city-financed dog park is going to happen in the near future as the city looks for cut $78 million from its current budget and is even considering cutting all funding for the Zoo. A mix of private memberships, advertising and corporate sponsorships should all be considered. Go out, make your voice heard. Kansas City will be better for it. The AVMA has released its census that comes out every 5 years on pets and pet owners. The USA Today picked up a story on the release of the census. According to the study, 7.6 million more households own pets than during their last census in 2001 -- raising the grand total to 59.5% of all homes owning a pet. By comparison, only 35% of US households have children under the age of 18. Of those houselholds with pets, 66% own more than one pet, and just over 20% owned at least 5. That's aproximately 13 million households that have 5 or more pets. In total, this leads to 81.7 million cats in the US, and 72 million dogs. Vermont and Idaho have the highest % of pet ownership. Overall, people spend $24.5 billion in medical care for these pets, leading pets to live longer lives. All of this is great news for a lot of people. Vets will continue to have a lot of customers, and shelters should have a huge number of potential adopters as pet ownership increases. Meanwhile, cities should be making note of the trends too. As more and more people own dogs -- and own multiple dogs -- public policy should reflect these changes in how people live. Cities need to be investing more money into dog parks, and walking trails. Ridiculously low pet limits should be gotten rid of (as 13 million households would be violating the law in the majority of Kansas City's cities and suburbs with their 5+ animals). With more dogs, cities are going to need to invest more money into their animal control departments to be sure they are keeping up with the times -- and work toward making their animal control departments self funding. They'll also improve policies that allow for outside seating at restaurants so restaurants can more easily allow pets to dine with their human patrons. Meanwhile, in most cities and states, pet owners represent the MAJORITY of voters....which should make them more demanding of more pet-friendly policies -- including dog parks, cruelty cases, and anti-BSL. Society is changing...cities that don't notice and keep up with these trends will be left behind as people will prefer to move to their pet friendlier counterparts. On November 27th, the Dog Park committee appointed by the Kansas City City Council and the KCMO Parks board will begin meeting to provide recommendations for dog parks in Kansas City. Improved usage of city parks has been on Mayor Funkhouser's agenda from early on in his tenure, and I know that my post recommending increased penetration of dog parks made it on his desk as a possible solution. Initially, the city parks board passed a policy that would prevent a dog park from going into a park that was smaller than 100 square acres. However, they waived that policy awaiting the recommendation of the park's board. I cannot stress enough how important I think dog parks are for Kansas City. Our parks are completely underutilized. About 45% of the people in our city have dogs...and in a city of nearly 600,000 people, we have 1 dog park. That's not nearly enough. There is a great story in the Washington Post about dog parks in the Washington DC area (hat tip to Deb Hipp from Woof passing this along). For many people in other areas of the country, dog parks have become a fabulous meeting ground for the people in the neighborhood. Single people who are new to town often meet their neighbors, friends (and story mentions several spouses) at their neighborhood dog park. They've become a popular meeting place. And as neighbor's meet neighbors, and hang out in the city's parks, they become better neighborhood watchdogs (which brings down crime) and increases satisfaction of living in areas. There is also anecdotal evidence that points to neighborhood dog parks actually increasing home values significantly as people look for this amenity. The Post article has a lot of great quotes in it that sum up my thoughts on a lot of the opponent's argurments against the dog parks. "At first people questioned why we were building parks for dogs", said Tim White, director of the Fairfax County (VA) Park Authority. "But they're not for dogs. They're for people. Saying you're building a dog park for dogs is like saying you're building a golf course for golf balls." "We realized a long time ago that these parks weren't about the dogs so much but about people coming together and building communities," said Steve Temmermand, division chief for Arlington Parks, Recreation and Cultural Resources. "There are potluck supper clubs, book clubs, people exchange movies, all kinds of stuff. It's an entire social network. People have met their boyfriends, girlfriends and spouses at these parks." In addition to being good for dog owners, well exercised and socialized dogs make people MUCH safer from potential dog bites and attacks. 1) Build a couple of regional-sized dog parks, similar in scope to the one current city dog park at Penn Valley Park. Using a couple of the city's larger regional parks like Hodge Park, Minor Park, Swope Park and Barkley Riverfront Park would provide large regional dog parks. 2) Get these large parks largely funded through advertising opportunities for businesses. Sponsorships of certain things like benches, a bulletin board, fencing, trees, etc would be good advertising for animal-related companies and would offset some of the costs of the parks. Culver City, CA provided a fabulous model for how this might look to offset these costs to the general public. 3) Once these are complete (which should be sooner rather than later), neighborhoods should be allowed to propose neighborhood off-leash areas. While many of them can be fenced, I don't think fenced off-leash areas are a requirement. As long as people are able to control their dog and get it to come to them using hand signals or verbal commands, then they should be fine running in an off-leash area without a fence. These should all be subject to neighborhood approval, but should be open for discussion. 4) One final thought on this is that there are many areas of the city that could be regionally set as dog parks. Here is an example of a dog park in Toronto (hat tip Marjorie) that is a seasonal dog park. During the spring, summer, and early fall, the area of the park is a used for baseball leagues. However, once the baseball league season is over, the baseball park is completely unused. So they have put up a temporary snow fence to fence off the area so that for 6 months of the year it can be used as a dog park. Driving around our city, there are dozens of these softball and baseball fields that get no use from October -March and could be fenced off for use as dog parks. Just another way of meeting Mayor Funkhouser's goal of increasing usage of the city's park space. Hopefully our committee that is headed by architect and former city council hopeful Mel Solomon will come up with some good recommendations. Even more hopefully, our city appointed parks board will listen to their good recommendations and follow through with them. It would increase the overall use of parks, provide a service to nearly 1/2 of Kansas Citians, improve neighborhood safety by having more people out and about and increase safety through better exercised and socialized dogs. And should be able to be done with minimal cost from taxpayers. It's a complete win for everyone. Let's make it happen. On Tuesday, the Kansas City Parks Board decided not to implement its rash decision to ban dog parks from 90% of the city's parks. They have now decided to actually wait until the task force they had recommended actually gets assembled and makes its recommendations. A task force will be made up of 15 people - -12 nominated by individual city council members, 2 from the WOOF group, and 1 member of the city's animal control division. Obviously I applaud this decision by the Parks Board -- they were very hasty in their decision to ban dog parks from all parks under 100 acres. It was a rash, and very arbitrary decision. Hopefully the task force approaches the dog park situation from a global perspective first...without starting by first looking at the Sunnyside Park Proposal. Kansas City would do well to start with what the Parks Board intended by looking at adding another 2 or 3 larger regional dog parks. Using a couple of KC's larger parks, like Hodge Park in the North, Minor Park in the South, Swope Park to the East and (Penn Valley Park can serve the inner city for now. although Barkley Riverfront Park is another underutilized viable option for another park), would give KC residents a couple of larger parks that would be destination parks. There would be plenty of parking available, and more than enough space for good, quality dog parks. Then, once those parks are built, we can look at doing smaller, neighborhood dog parks that could be evaluated on an individual basis and built to suit that neighborhood. Sunnyside would be a consideration for such a park, but with multiple larger dog parks available, the size and scope of the WOOF proposal could be downsized to utilize less space -- and would also need less parking because it would be primarily serving the Waldo Neighborhood -- thus taking out the primary complaints of the few opponents of the park. The key is to get the regional parks established very quickly so that the WOOF group could redevelop a new, smaller-sized plan and begin discussions on that for Sunnyside Park. The Parks Board is not overflowing with money, but it seems that private money could be available by soliciting sponsorships/naming rights from various area dog-related companies (hat tip Mark Forsythe). If at least half of the funding could come from corporate sponsorships, the city would be able to act on these fairly quickly. This would be a great solution to the underserving of the dog-loving public, take few funds from the overall parks budget, and still rightfully allow neighborhoods the opportunity to build smaller, neighborhood dog parks. Everyone would win...let's make it happen. A writer for the Pitch (the city's alternative newspaper) was at the dog park meeting last week when the Park's board refused people's rights to speak, and violated the Missouri Open Meetings Act with their pre-aggreed to vote on amendments to the Dog Park Rules and Regulations. Citizen involvement. Open government. More people using the parks. Kansas City Mayor Mark Funkhouser says he stands for these things. Yet last week, the parks board he appointed straddled those ideals and dropped a steaming load on them.